St. Joseph’s Historic Church and Cemetery located along McDowell Creek in Wingfield Township joined the Geary County Historical Society’s Museums in 2008. This Gothic-Revival style church is a wonderful representation of turn of the 20th century country churches, many of which were built in the same style. St. Joseph’s was part of both the Ashland and McDowell Creek communities, and families from both communities are buried there. 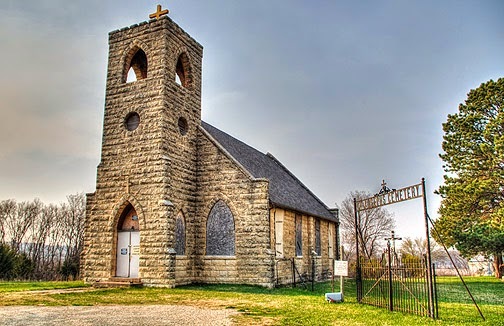 The Church and Cemetery trace their religious roots to Father Louis Dumortier, who served in Northeast Kansas Territory and State from 1859-1867. Michael Brannick, a stonemason and community leader organized to build the first church in 1870 on the 3+ acres of land donated by James Ryan, an 1855 pioneer in the area. Prior to that, the community would have held services in someone’s home, in another public building, or in a tent if necessary; if available a Jesuit from St. Mary’s Mission would hold the services. In the west during territorial days many communities consisted of only a scattering of farms sometimes miles apart. So, before communities had well established populations and funding, circuit preachers/priests traveled to communities in a designated area to perform services. If the preachers/priest was not in attendance communities held services on their own in someone’s residence. The McDowell Creek Community itself began with an influx of settlers, mostly Irish Catholics. Many of them were single men, but they soon created families to thrive on the rich land of the McDowell Creek. Many families in the McDowell Creek Community also have relatives in the nearby Ashland Community since the single men looked to nearby Ashland for wives. People from both communities attended St. Joseph’s Church. The Church was originally a small limestone structure that resembled the one-room schools in the area. The old structure was removed and the current structure was built in 1910. The Catholic Church held services in St. Joseph’s Church until it closed in 1989. In 1993 the items inside the church, including the Stained Glass windows were removed and auctioned off or taken to other churches in the area. The stained glass windows had an upper portion and a lower portion, and it’s said that the lower portions were purchased by families in the community and in 1993 those portions of the windows were removed and sold to or given to the local families. The upper portions of the windows were moved to St. John Vianney Catholic Church in Maple Hill, Kansas. The efforts to restore St. Joseph’s Historic Church and Cemetery by the Historical Society have passed two milestones since 2008: the church property has been listed on the State Register of Historic Places, and the deteriorated roof has been replaced with completely new sills, trusses, sheeting, shingles, and flashing. The building however, is a long way from being opened for public use. Now the windows, floors, balcony, interior stairs, and walls need serious work. Down the line utilities, water, waste disposal, and doors will have to be considered. The Historical Society hopes that the building can be restored with help from the local community and other people in Geary County and that it will again be open for use as a community building, reception hall, ceremonial space, and mini-museum. restoration project. Donation of time and materials are appreciated, and monetary donations can be sent to the Historical Society at PO Box 1161, Junction City, 66441. You can also contact the museum, 785-238-1666 or GearyHistory@gmail.com with any information or stories you may have about the church including photos, especially prior to the closing in 1989.